In terms of all-around financial performance, Southfield, Mich.-based Sterling Bancorp Inc. was the top public thrift in S&P Global Market Intelligence's analysis for calendar-year 2018. 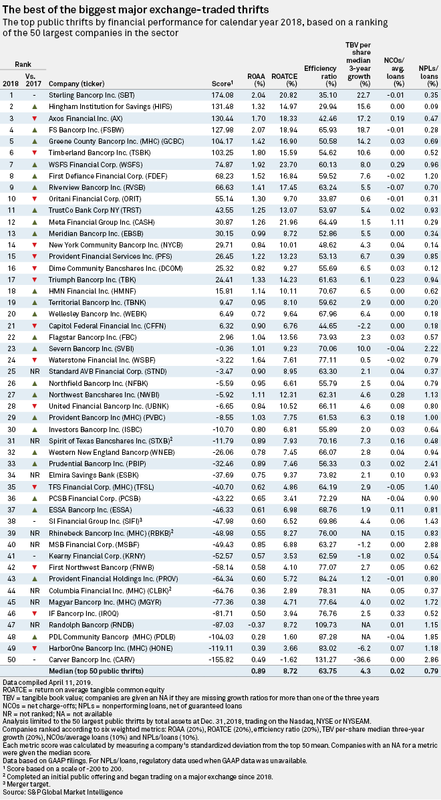 Sterling Bancorp's first-place ranking comes after the bank was the No. 1 public thrift for 2017 and earned the title of best-performing large U.S. community bank for the last two years. 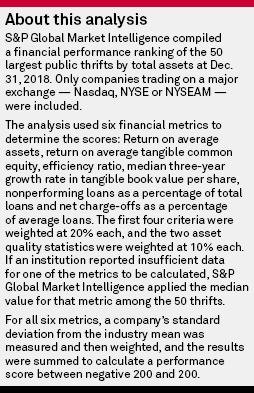 A runaway winner in the 2018 public thrift ranking, Sterling Bancorp excelled in all six categories used in the analysis. Among the 50 largest major exchange-traded thrifts by total assets at Dec. 31, 2018, it was first in three-year tangible book value per-share growth, placed in the top three for profitability metrics and was in the top quartile for asset quality metrics. Total gross loans at Sterling Bancorp were up 7.1% in 2018 but declined slightly during the fourth quarter. Despite customer uncertainty about the housing market and U.S.-China trade tensions, Sterling Bancorp is projecting strong balance-sheet growth. In its fourth-quarter 2018 earnings release, Chairman and CEO Gary Judd said, "During 2018, we expanded our presence in the greater Seattle and New York markets, and now operate in four of the most attractive markets in the U.S. based on household income, wealth and employment rates. We expect to continue gaining share in these markets as we add client facing professionals and will continue our focus on expanding commercial lending, which we believe will translate into high single- to low double-digit annual growth for both loans and deposits." Sterling Bancorp also has started returning capital to shareholders. It announced a quarterly cash dividend in January 2018 and then a $50 million share repurchase plan in January this year. 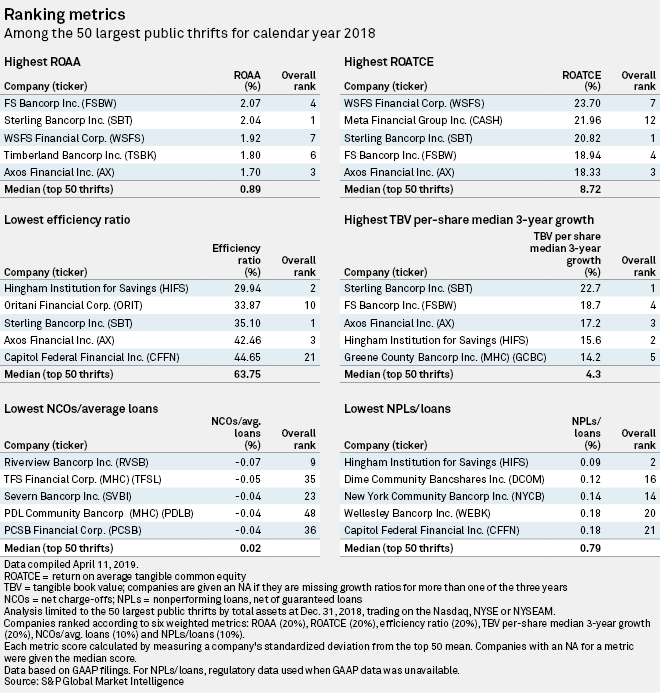 The next five companies in the 2018 ranking — Hingham, Mass.-based Hingham Institution for Savings; San Diego-based Axos Financial, Inc.; Mountlake Terrace, Wash.-based FS Bancorp Inc.; Catskill, N.Y.-based Greene County Bancorp Inc. (MHC); and Hoquiam, Wash.-based Timberland Bancorp Inc. — were the same as in the 2017 ranking but in a different order. Axos Financial is approaching the $10 billion asset threshold, while the other four companies held less than $2.5 billion in total assets at the end of 2018. Eight thrifts entered the 2018 ranking, including three with IPOs since the beginning of the year: Poughkeepsie, N.Y.-based Rhinebeck Bancorp Inc. (MHC); Conroe, Texas-based Spirit of Texas Bancshares Inc.; and Fair Lawn, N.J.-based Columbia Financial Inc. (MHC). Rhinebeck Bancorp completed a mutual holding company conversion in January. Columbia Financial's MHC deal completed in April 2018. Brockton, Mass.-based HarborOne Bancorp Inc. (MHC), finishing at No. 49, is undertaking a second-stage conversion to stock form. Gross proceeds from the offering could reach as high as $310.5 million. Did you enjoy this analysis? Click here to set up real-time alerts for data-driven articles on the U.S. financial sector. Click here for an Excel template with the calculations for each metric. The template also allows users to adjust the time period, the weightings and the maximum standard deviation for a new ranking.